It was almost unthinkable but true. Brothers caught up in a world war and fighting on opposite sides - one for the United States and the other for the Japanese. Fred Yoshito Kameda was born on May 5, 1923 in Waialua, Oahu, Hawaiian Islands. Fred had seven brothers (Mitsuo, Toshio, Fumio, Shigeo, Tom, Donald and Robert) and all were great ballplayers. Older brother Shigeo was a star shortstop at Leilehua High School and played with the Asahi's and Rural Red Sox in Hawaii. He later attended Meiji University in Tokyo, Japan and captained their Asian Games championship team in 1940. Donald attended Saint Louis College in Kaimuki on a baseball scholarship. Fred Kameda attended Mid Pacific Institute in Oahu where he proved to be an outstanding pitcher. He later pitched for Azuma of the Hawaiian amateur league. On December 7, 1941 the Japanese attacked the US fleet at Pearl Harbor. Americans of Japanese ancestry in Hawaii were treated with suspicion and subjected to curfew laws. At the same time in Japan, Americans of Japanese ancestry like Fred's brother, Shigeo, were conscripted into the Japanese military. Unbeknown to his brothers at the time, Shigeo served on a Japanese Imperial Navy submarine in the Pacific and also on an aircraft carrier that saw action in the battles of Kiska, Saipan and Leyte. Meanwhile, in Hawaii, Fred Kameda was not allowed to serve his country until 1943 but on March 23 of that year he left his job as a clerk at Territorial Motors in Honolulu and enlisted in the Army. 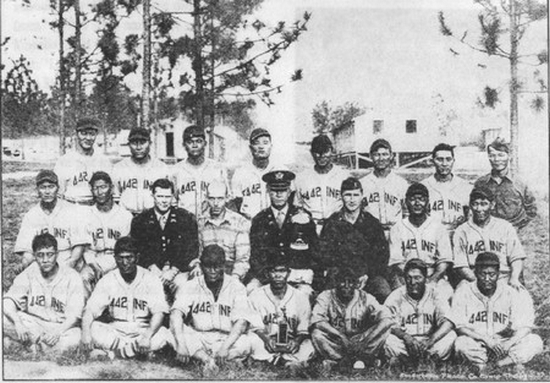 Kameda trained at Camp Shelby, Mississippi with I Company, 442nd Regimental Combat Team (RCT) and became a star pitcher with the championship winning 442nd baseball team. On June 2, 1944, Private First Class Kameda and the 442nd RCT disembarked at Naples, Italy. On June 26, the 442nd RCT went into combat near Belvedere. Amid heavy fire and counterattacks from the enemy, Kameda took an enemy shot to the chest. He died a short time later. "When they asked for volunteers for the 442nd RCT," recalls Donald Kameda, "my brother Fred was the first to volunteer. He was also the first one to die in I Company." Fred Kameda, who was awarded a bronze star, is buried at Honolulu Memorial. His brother, Shigeo, who unwillingly fought for the Japanese, survived the war and returned to the United States twenty years later. "Every December 7," Kameda's mother told the Honolulu Star-Bulletin in a 1963 interview, "I think of the death of my son, Fred, and I am thankful my other sons came home." Excerpts taken from In Freedom’s Cause: A Record of the Men of Hawaii Who Died in the Second World War (1949) with permission from The University of Hawaii Press. Visit www.ajawarvets.org for more information on Americans of Japanese ancestry servicemen. 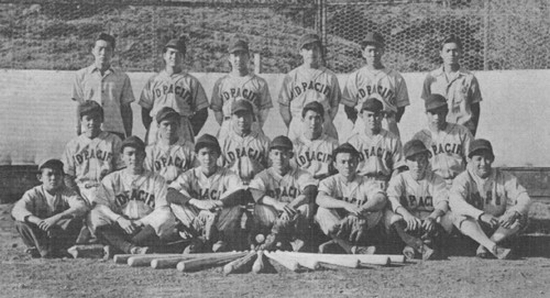 Thanks to the Mid-Pacific Institute for the photo of their baseball team. Thanks to the Honolulu Advertiser for supplying copies of related press articles.